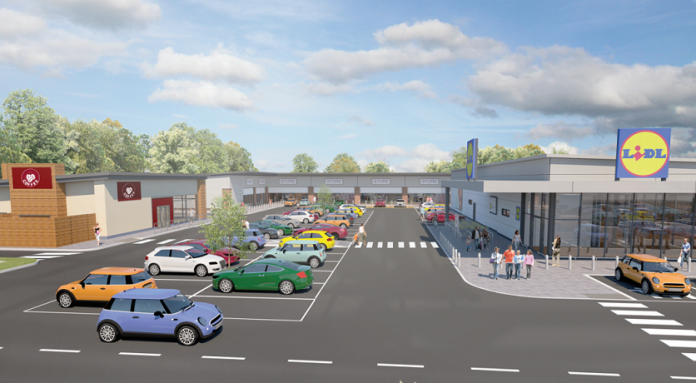 Plans from Lidl for a new supermarket, 6 shop units and a drive through coffee shop have been recommended for approval by Nottingham City Council. The shops would be built at the corner of Beechdale Road and Western Boulevard. The site is currently vacant, but was formerly occupied by Beechdale Baths. The baths were demolished in 2017.
sale area of 1,410 m2. 4 units would have a sale area of 371 m2, 2 units would have a sale area of 186 m2, and the drive through coffee shop (use class A1/A3/A5) would have a sale area of 134m2. The single story Lidl supermarket would employ 40 staff (full and part-time equivalent), while the occupiers of the other retail units, though these have not yet been confirmed, are likely to create around 44 full time equivalent jobs. A document released by the council ahead of the final decision on the development reads: “The site has been vacant since 2017 when the former swimming baths were demolished. The site lies within the urban area where the reuse of brownfield sites is actively encouraged and supported by the national and local planning policy. The principle of retail development on the site is supported by the emerging Local Plan Part 2 allocation. “The proposed development would create significant investment in the local area and enhance the retail offer available locally. This physical investment in a highly visible location would increase confidence in Beechdale and demonstrate the viability and attractiveness of investing in this part of Nottingham.